As I mentioned in my first post about recycling denim, blue jeans were a casual clothing staple in my teen years. And every pair of jeans that was worn out in the knees was cut off for shorts. Long summer days were spent sitting on the dock, getting tan and fraying the edges to create the perfect degree of frayed edge. That same quality of denim has been used in crafted items as well. Checked out the variety below. First a couple of ideas from Martha Stewart. 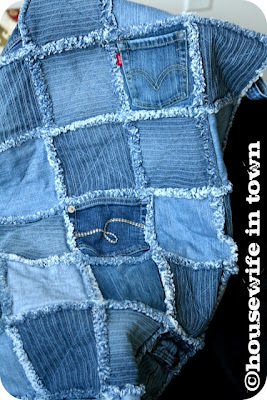 Here is a rag rug made from denim strips with unfinished edges. It is then allowed to frayed. Must be incredibly soft on the feet. 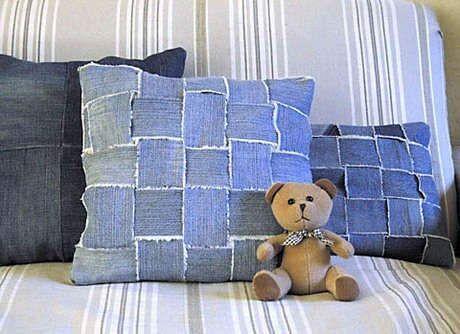 And below is the same treatment but on pillows with wider strips. This concept would look great in my living room as well. 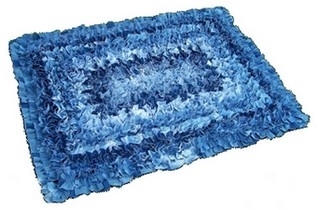 Here is a different style of rag rug made from many 2" X 3" squares. 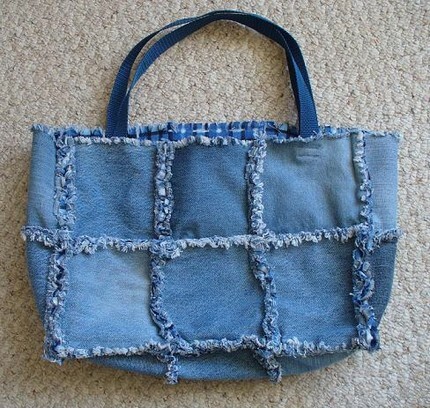 It is a great use for scraps. A much simpler use is these country style Christmas ornaments by Elizabeth Revels with frayed edges. This denim pillow design combines both weaving and frayed edges. 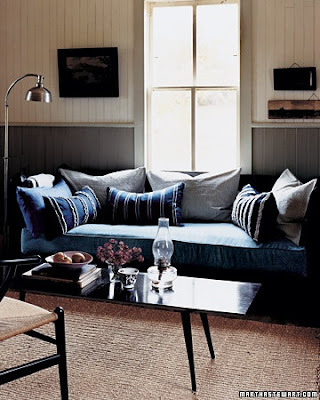 Note the pillow in front uses denim of a similar shade. The one on the back right uses denim from different pairs of jeans with a color variety. There were many patchwork quilts sporty exposed edges that were allowed to fray. Here is one completed by Laura of House Wife in Town. 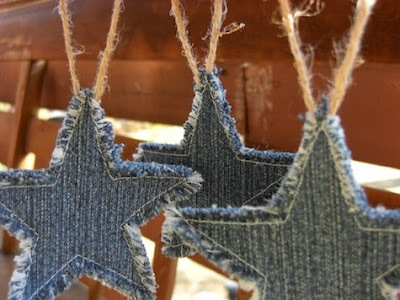 If you wonder how to fray denim - well the easy answer is to google the topic of course! If this is the first of my posts you've stumbled upon you should know it is part of a series on denim. Below are links to five other previous posts that also are part of this series and have many more ideas. Oh my....and I have two rubbermaid boxes in my attic filled with old jeans! Awesome! Thank you for sharing this!